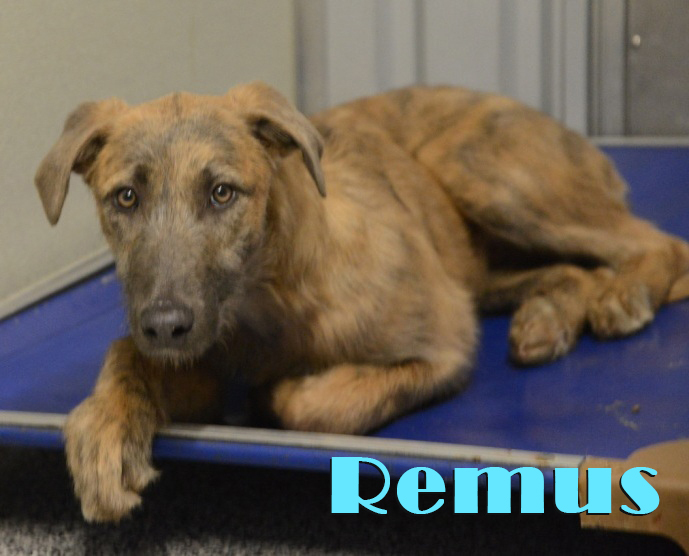 Remus is a sweet male Greyhound x Wolfhound puppy born August 18, 2018. 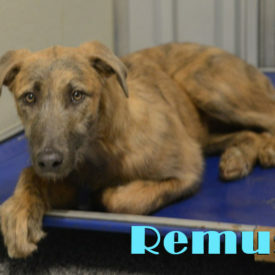 He was picked up in Northern Alberta by NCGL when his owner became ill and could no longer care for him. Do you love curling up on the couch to enjoy a peaceful evening with popcorn and a movie? Or a gentle stroll to the river to watch the sunset? Me too! I’m looking for a calm and quiet home with another animal for company so I don’t get too lonely when my people aren’t home. I would enjoy the chance to introduce myself to children but would also like to have my own safe space where I can go to decompress when things get too exciting. I love to play tug and am super gentle with my mouth. I know all my basic obedience when I am inside my foster home but outside and on walks can still be a little overwhelming for me and I would appreciate your patience and kind words to help me gain confidence in my new surroundings.